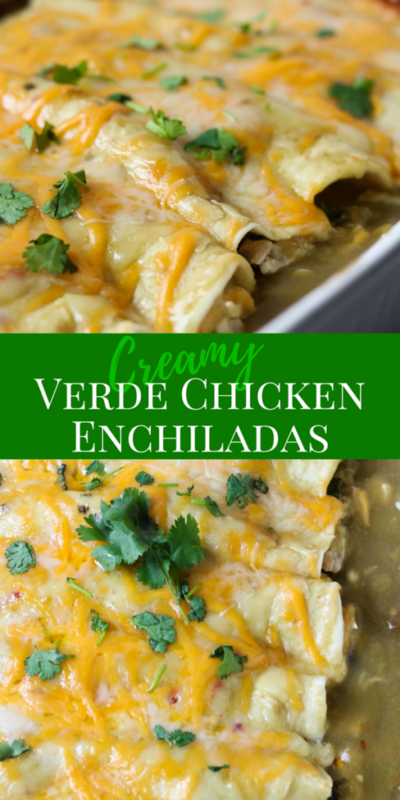 This Verde Chicken Enchilada recipe is a delicious and crazy easy enchilada to make at home. The filling is the perfect blend of tender chicken, fresh cilantro, black beans, onions and green chilies mixed in a delicious cream sauce all wrapped in a warm tortilla. Then they are smothered in verde (green) enchilada sauce and pepper jack cheese which gives this recipe just the right amount of heat! 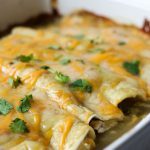 To keep this recipe super easy I use flour tortillas, store bought verde enchilada sauce, I don’t make my own cream sauce, and I use rotisserie chicken! Traditional enchiladas can be daunting to make at home. That is why I love this recipe! Chopping an onion, cilantro and some chicken. Figuring out what to do with your extra time! During a super busy night we may just eat these enchiladas alone or with chips and salsa. But if we are having a sit down dinner kind of night I will make Cilantro Lime Rice and chips with guacamole to go along side. My 15-Minute Refried Beans or a mexican slaw would be great on the side too. PS… This recipe makes a lot, but they make EXCELLENT leftovers! Mexcellent!! If you have a really busy week this recipe can be made ahead. Prepare the filling and roll up the enchiladas, just leave the sauce and cheese off the top until it is time to pop them in the oven. To store your pre-made verde echiladas, keep them covered in the fridge for up to 3 days. Be aware when you are ready to cook them you may need to add 5 minutes to the baking time. 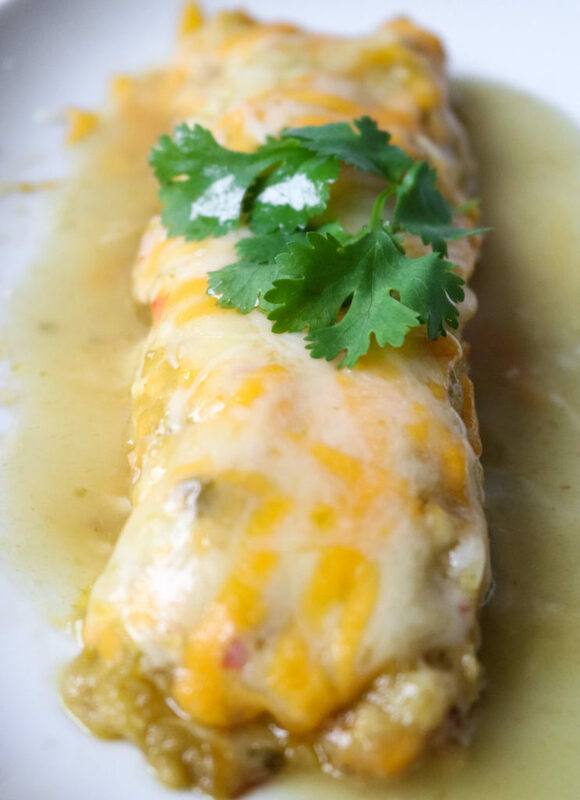 PIN THE RECIPE FOR VERDE CHICKEN ENCHILADAS HERE! onions (note on the onions- for faster prep you can dice your onions very small and throw them in raw. They will still have a little bite this way. If you prefer a soft onion, saute them in a little olive oil before adding them to the chicken mixture). Pour half the verde enchilada sauce into the bottom of a 9×13 baking pan. Divide the chicken filling between the flour tortillas, this recipe will make between 10-14 enchiladas. Lay them, seam side down, into the prepared baking dish. Top the verde enchiladas with the remaining sauce and cheese. Bake, covered with foil, for 20 minutes at 350 degrees, then remove the foil and bake for an additional 10 minutes. Add sauteed jalapenos or jarred jalapenos for a little extra spice. Try using carnitas (pork) instead of chicken. Use pinto beans instead of black beans. Make it vegetarian! Omit the chicken all together- instead use a mixture of black beans, pinto beans and rice. Top with fresh sliced avocado. 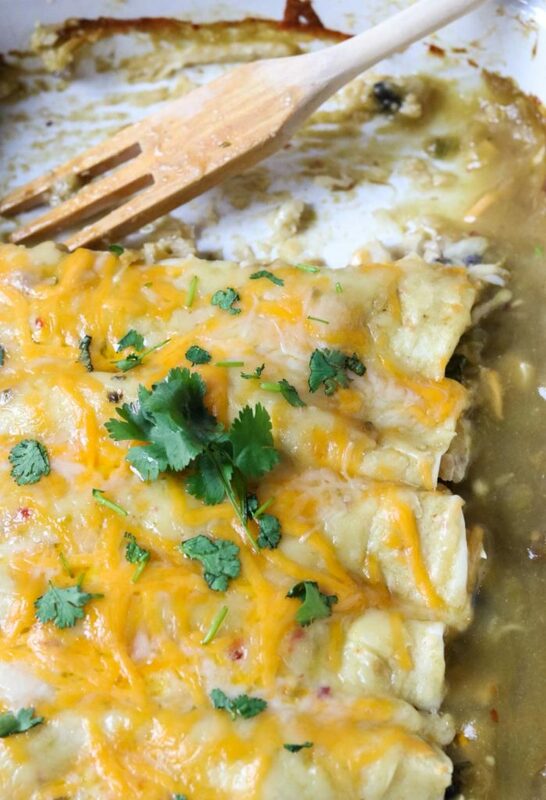 I hope you give this recipe for Verde Chicken Enchiladas a try in your kitchen! 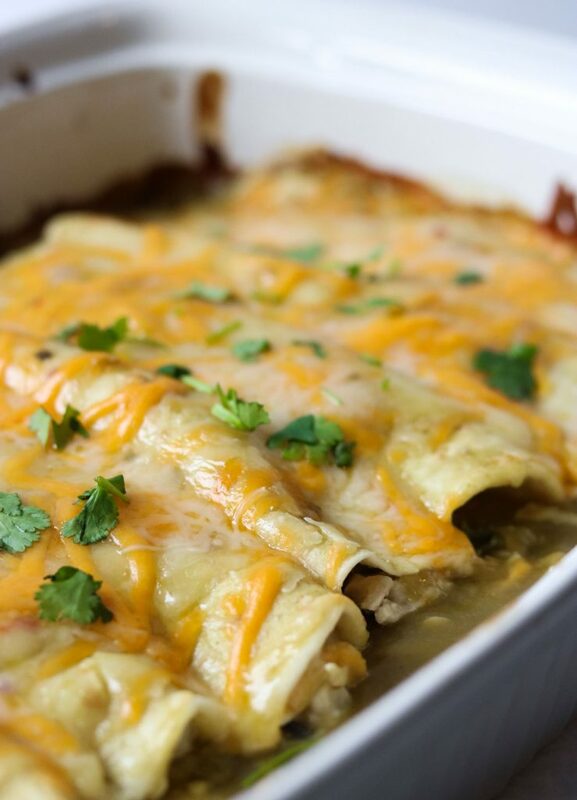 Delicious chicken enchiladas with a verde enchilada sauce. This easy enchilada recipe make a great Mexican dinner. They are full of a creamy mixture of chicken, onions, cilantro, black beans, and cheese, rolled in easy-to-use flour tortillas and smothered in cheese and sauce. Additional chopped cilantro can be used for garnish. **ONION NOTE- For super fast prep I dice the onions very small and throw them in uncooked. They will cook a little in the oven but will still have a very tiny bite to them- which we like. If you cannot stand an undercooked onion, saute your onion in a little olive oil over medium heat for 5 minutes before adding them to the enchilada filling. In a large bowl combine the chicken, black beans, onion, cilantro, green chilies, mushroom soup, and ½ cup cheese. Stir until well mixed. Pour 1½ cup of verde enchilada sauce in the bottom of a 9x13 pan. Top the enchiladas with the remaining sauce and sprinkle with the remaining 2 cups of cheese. Bake, covered with foil, for 20 minutes. Remove the foil and continue baking an additional 10 minutes. To make ahead: Prepare the enchilada pan with 1 1/2 cups of sauce. Mix together the filling and roll into the tortillas. Lay the enchiladas in the 9x13 pan but do not add the cheese and sauce on the top. Store, covered, in the fridge for up to 3 days. When you are ready to bake, top with the sauce and cheese. Be aware you may need to add 5 minutes to the cooking time. This is better than a Mexican restaurant!